« You go and laugh at me now. So, yesterday. BIG DAY for Make Room for Kids. I arrived at Children’s at 9:30 a.m. to meet up with Jenn Strang from IKEA who came bearing the carts, and to wait for the rest of the crew who were due to arrive at 9:45. At exactly 9:45 a.m., and I do mean exactly, and I asked and they swore they didn’t wait up the block, Microsoft pulled into the main entrance circle at Children’s with a caravan of SUVs where eight employees, grinning from ear-to-ear, hopped out and got to work unloading carts and carts of equipment and gifts for the kids. That’s Luke Sossi there in the green. If you ever see him on the street, you should grab him and hug him because this man is an angel on Earth. Don’t worry. I’ll bail you out. We then headed up to the seventh floor playroom where Microsoft stacked up the XBOXs to prepare them for installation in the rooms and to give us a chance to take a few pictures of such a wonderful display of generosity. That’s Nancy Angus from the Mario Lemieux Foundation there on the right. 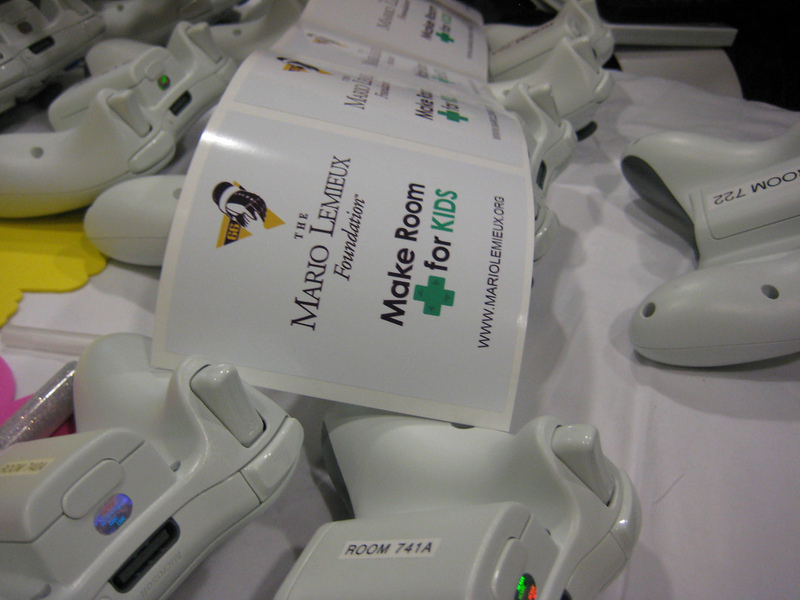 She was a huge help in not only working with Microsoft and the hospital to make this happen, but also in sort of being the official voice for Make Room for Kids yesterday. She’ll continue to be a huge help as we roll out Phase II in the coming weeks, which means another trip for me and Mike to the Mario Lemieux Foundation offices, which hopefully means an opportunity for me to steal some Mario-autographed stuff off the walls. Immediately after that picture was taken, he bit the head off of a bat. True story. The kiosks are fantastic and super easy to wheel around. In the background there is David Severino, the Microsoft XBOX guru. You guys, HE WAS WEARING X-BOX SNEAKERS! Love. My inspiration, nine-year-old leukemia patient Genre Baker and his mother came and we put him to work putting stickers on all the games and movies. I was just so glad he got to come and witness the good that came out of his fight against leukemia, which is a fight he is completely winning. When I saw him a couple months ago, he had practically no hair and was wearing a surgical mask at church. Then when I saw him just a month ago, he had shed the mask and his hair was growing. Yesterday, his mother told me he had just had to get a haircut and that his latest blood work was fantastic! I expect a tap-out from leukemia real soon. After we took pictures, it was installation time. Have you ever tapped an ant hill with your foot and suddenly, the ants are all, “FIRE FIRE FIRE!! !” and hurriedly scatter every which direction? That’s basically what happened. 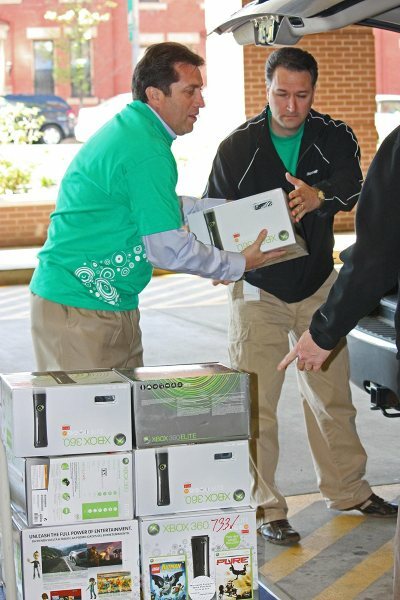 Luke gave the signal and the Microsoft employees and Mike grabbed XBOXs, which were already labeled for each room, grabbed extra controllers, grabbed cables, fanned out and got to work, installing 23 XBOXs in under two hours. There was one room they couldn’t install, simply due to the health of the child. 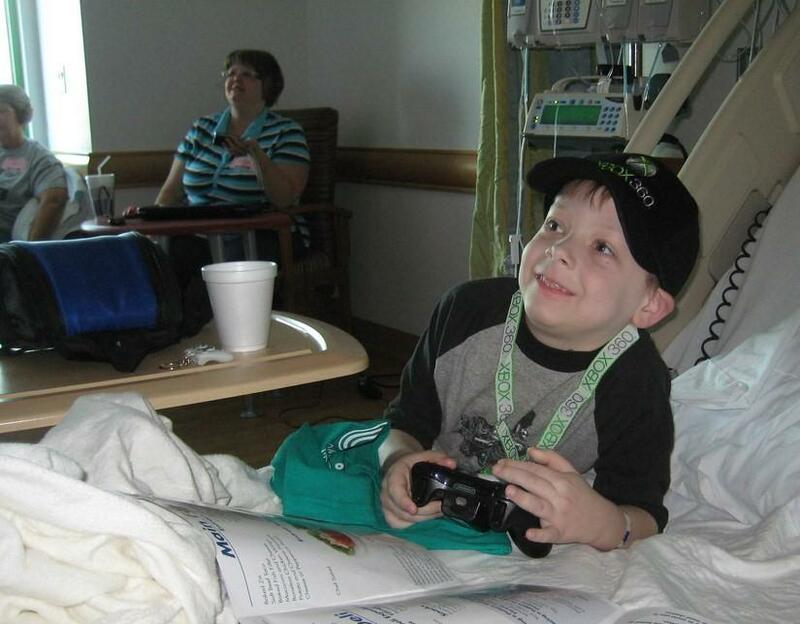 So, keep that kiddo in your thoughts and prayers that he or she will be well enough to use the XBOX soon. I had a chance to talk to a few of the kids, which I loved. They’re so strong. Really strong. Way stronger than me. 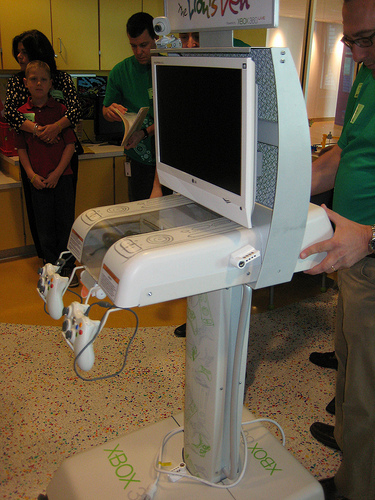 In one of the rooms, the mother of an infant transplant patient requested games for the newly installed XBOX so that she could pass some time, which is something I hadn’t even considered — that parents of smaller children might get some use out of “big-kid” games. That thrilled us all. As tears roll down my face…. That is awesome! Thanks for sharing the story and pics! *stands. clap clap clap clap clap* WOOOOOO! Pensgirl – great point. Reminds me of the time Ginny dropped that gem of a high school photo on us and immediately went on a posting craze in order to dump it to page 2. Unless I missed an assholish comment somewhere above, ditto to everything everyone else has said. I hope it takes the edge off of what those little rascals and their families are going through a bit. Lovely. Inspiring. Thank you for sharing. Pittsburghers get stuff done. This is very inspirational. Thanks for your tireless work, Ginny. Thanks for shining so much light on this. It’s hard to imagine any effort more worthwhile. “This is the stash we were able to provide.” I want that like on a coin. Anyone have any ideas how I can steal this idea and pass it off as my own come election time? I think Mr. Rogers said it best” It’s a wonderful day in the neighborhood.” Ginny, thank you from all the kids today and in the tomorrows to come. Thanks for sharing the pictures and video Ginny! It was a terrific collective effort by everyone involved, and the kid waiting for his xbox to be installed made me cry. I love my town! A heartfelt thank you to each and every person who made this possible. Cried like a baby the whole video. My son had to go to Children’s once very recently and as worried and scared to death as I was, I was so humbled by how much sicker the other kids were and how I got to take my little guy home with me safe and sound. God bless you all at Microsoft, Ikea, and especially Ginny. I couldn’t comment the first time I read this due to watery eyes, but this is just Awesome with a capital A! Kudos to you and every one involved. So great to know there are some truly selfless people out there! Can’t watch the video, I’ll cry like a baby. Great job. your hair looks nice by the way. Ginny, your Dad and I are not only cousins, but we were best friends when we were kids. Officially, I guess that makes you my “second cousin”. Even if we weren’t related, I still couldn’t tell you how proud I am of you. You are truly awesome! Well, this just made me cry and cry. <3 Happy, proud tears, of course. God, I wish I had a million dollars to give you…. 2nd what Bojack said: MAZEL TOV!!!!!!!!!!!!!!! 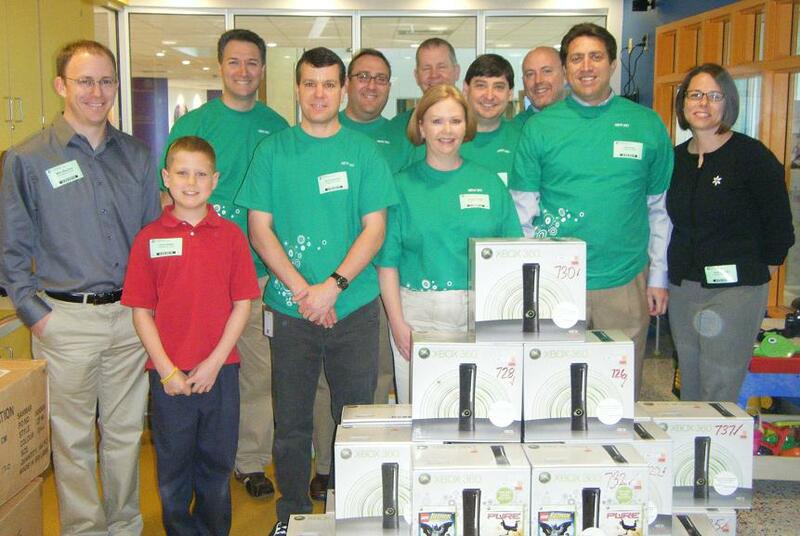 You and the Microsoft Crew make me proud to be from Pgh., a small city with a BIG HEART. Awesome job! Makes me proud to be a Pittsburgher, and even more proud to know and have worked with many of the Microsoft people involved! Wow! Did not get a chance to read this yesterday and have tears flowing as I write this. We can be proud to have made a difference. Fantastic job! 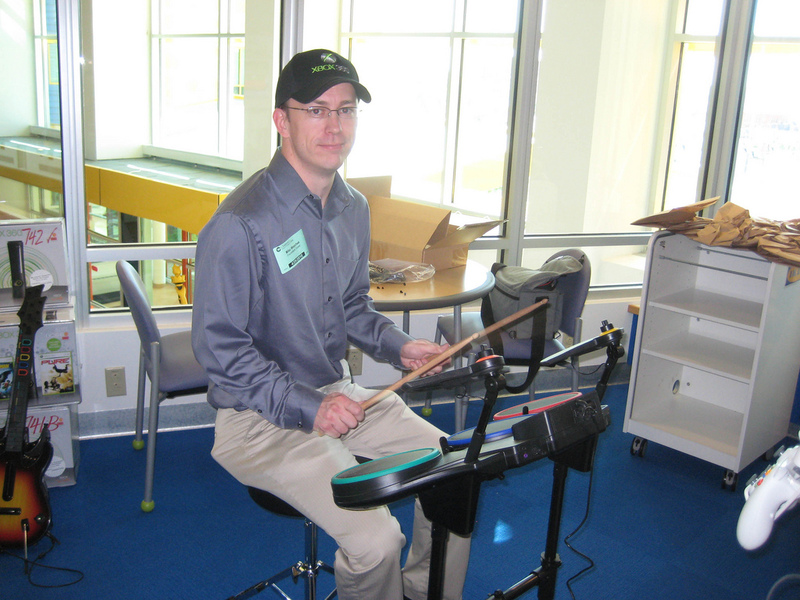 Special thanks to Ginny, Mike, Mario Lemieux Foundation IKEA and those special employees of Microsoft in Pittsburgh. Awesome work! Proud to have you as friends :-) Totally awesome…what a blessing to the kids! Proud, proud tears of joy. Thank you Ginny, Mike, Microsoft and all the readers of this blog … this is why Pittsburgh is the best city in the world!! Thanks so much for your work. My cousin has spent more time at Children’s in the last two years than at home, but kidney number three seems to be the charm. I know that he had a great experience there, but would have loved an XBox in his room. I’m out in the flats of Cbus, OH, but love to see the work that’s going on back home in the Burgh. sent to 19 year old daughter laboring over a college essay on “The Meaning of Life”. Sometimes when you think being a “regular person” has no power you watch something like this and realize you are wrong. Yea!!! As a husband who see’s how attached and emotionally connected his wife becomes to these children, this gesture is beyond words. Words really cannot express ….. Thank You everyone for pulling together and doing this for these children! WOW …….. This really shows how great people are and how some companies will help …. Ginny, your such an amazing person ! This is SO wonderful. Teary just reading it. Thank you for all that you do to inpsire and facilitate important things like this. Where can I get one of those nifty green tee-shirts? Bury it BING…Bury it ! I was wondering if we may use the picture of the little boy playing video games. This picture will be used in a video for our Nursing 140 class on Gaming in Health Care.